• Lithium Polymer battery with status indicator. The ECM702 is a small portable unit designed to be used to inhibit the use of mobile phones, within a specific area. The unit can operate using its internal battery for between 3-4 hours or for longer periods thorough the use of an external 12VDC power source. Six independent countermeasure transmitters are connected to a special antenna array in the lid. Each module is programmed via a special app running on a Windows based PC. Once the desired parameters have been set they are stored within each unit. The user now simply powers up the unit and all transmitters will function according to the options that have been set. The firmware within each unit can be upgraded via its USB port remotely. The application software also contains a program which facilitates remote diagnosis of each unit via the internet which alleviates the need to return the unit when programming issue occur. The operational parameters for the unit are programmed in using the special Windows app. The two integral countermeasure units are programmed separately via the USB sockets on the front panel. When the PC is plugged into each unit the relevant operational options will be displayed. Within each band there is a wide range of frequency options allowing the unit to be used in almost any country. Individual transmitters can be disabled if required. On the enhanced screen the user can set passwords and restrict access only to a single master PC if required. The App has a small database of national variations so when the specific country is selected the operators and frequencies allocations are displayed. The database can be enhanced on request. Within each band the signal can be configured to counter different technologies. For example, the GSM900 signal can also counter UMTS900 by setting the sweep rate high. 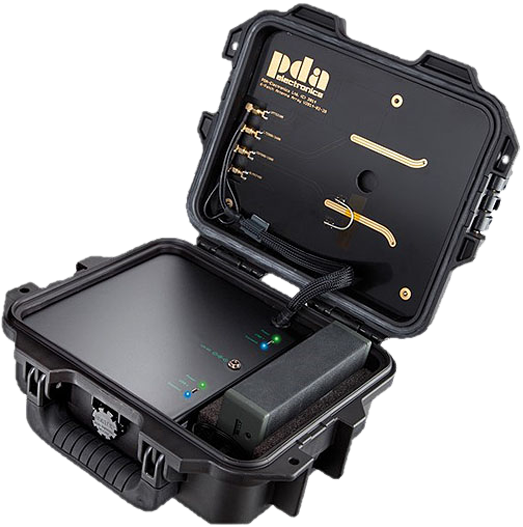 On the GSM1800 band, LTE1800 can be jammed as well by setting the sweep rate to low. In both cases the GSM base station signal will be affected as well due to the wider sweep rate variances. 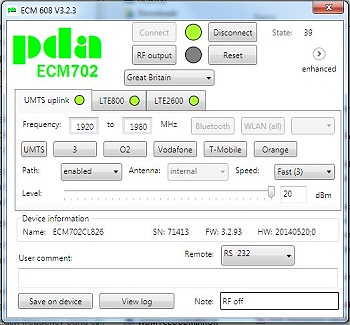 The ECM702 can provide a countermeasure signal over the whole WIFI range including Channel 14 (2.435GHz) which can be used by some WIFI bugs. The unit can also be set to specific bands or an individual channel.